Kandasamy Ponnamma is still haunted by the sight of her son, daughter-in-law and two grandchildren waving as they were taken away by Sri Lankan troops in May 2009. Ms Ponnamma wept helplessly as the bus carried off her loved ones, soon after security forces defeated Tamil Tiger rebels. She was among tens of thousands who had fled a tiny coastal strip near the north-eastern town of Mullaitivu, where the final stages of the 26-year conflict took place. That was the last time she saw her relatives. "The army promised a general amnesty to all those who had links with the Tamil rebels. That's why my son and several others surrendered. "I still don't know where they are or what happened to them," says Ms Ponnamma, who now lives with her husband near the northern town of Kilinochchi. Shanmugampillai Sarojini has a similar story. "When the civilians were leaving after the war, my son fell ill and fainted. He was taken in an ambulance and we were told that he was taken to a hospital in Kandy. We haven't heard anything about him since then." 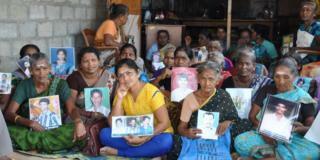 Ms Ponnamma and Ms Sarojini are among thousands of Tamils whose loved ones disappeared in the conflict. The violence ended nearly 10 years ago but there has been little progress in tracing the missing. The conflict is estimated to have killed more than 100,000 people. It divided Sri Lanka along ethnic lines - pitting the majority Buddhist Sinhalese-dominated government against the rebels, who fought for a state for minority Tamils. About 20,000 people, mostly Tamils, are thought to be missing. Many people still hope their relatives are alive, languishing in detention centres or in secret prisons, a view rejected by the government. In some cases there is footage suggesting those who disappeared may have been killed. A number of videos have purportedly showed extra-judicial killings of men and women thought to be Tamil rebels by soldiers. But the government dismisses them as fabricated. It points out that thousands of militants who surrendered have been rehabilitated and allowed to lead a normal life in recent years. After years of international pressure, it set up the Office of Missing Persons (OMP) earlier this year to investigate the disappearances. "We can have reconciliation only when people acknowledge that there have been violations," says Saliya Peiris, chairman of the OMP. Of those who went missing, he says: "We must acknowledge that and it should never occur again." Whether or not he and his team can help establish what happened to those who disappeared remains to be seen. Such a process could take many more years. The thousands of alleged enforced disappearances are one of many issues families in Tamil areas face as they adjust to life after years of war. Kilinochchi used to be the de-facto capital of the rebels. But all traces of them, including their cemetery, have been systematically erased. The area was in ruins when I was last there in early 2009. Today it's a bustling town with ATMs, fast food chains and businesses, as well as a busy highway and railway line. The Sri Lankan national flag flutters over a huge victory monument, a concrete cube pierced by a big bullet and topped with a lotus flower of peace. A lot seems to have changed in Tamil areas. New buildings and roads have transformed Mannar, Mullaitivu and Jaffna regions, the former rebel strongholds. But Tamils say core issues still need to be addressed. "I don't think peace has returned. We are still in a post-war situation," says Paikiasothy Saravanamuttu, executive director of the Centre for Policy Alternatives in Colombo. "What we need to move to is a post-conflict situation in which the roots of the conflict are not sustained and reproduced." Sri Lankan leaders whom I interviewed at the height of the conflict promised to come up with a political solution for the Tamil problem soon after the war. The previous government, headed by then President Mahinda Rajapaksa, spent millions of dollars on post-war reconstruction - but Tamils say there were few, if any, attempts at reconciliation. With the Tamil issue no longer dominating mainstream discourse in Sri Lanka, the long-standing demand for devolved powers to Tamil areas through constitutional reform has now been put on the back burner. And Tamil demands for accountability for alleged crimes committed during the war have also made no progress. In 2015, Sri Lankan leaders promised to set up a court with international judges to investigate alleged war-time abuses at a UN meeting in Geneva. But the government later rejected the proposal. Tamils say successive governments have not kept their promises and the international community has now forgotten their plight. So, their immediate priorities, they say, are to trace those who disappeared, and recover land seized by the army. Northern Tamil areas are still dotted with dozens of military camps and installations, several said to be built on formerly civilian land. Although the army checkpoints have gone, Tamils feel they are still living under the military. The Sri Lankan military told the BBC it had already returned more than three-quarters of the land under its control before 2009. But Tamils point out the military has built several hotels, as well tourist resorts and golf courses in the north and east - on both private and public land - and is unlikely to give them up. Presidential secretary Shiral Lakthilaka accepts that Tamil hopes in areas like devolution have not yet been met. "That is an uphill task we are facing as a political society in the south. There is lots of resistance… So we have to do it in an incremental manner," he says. But that will require consensus among political parties in the south - and public support. After suffering terrible losses Tamils in the north do not want any more violence. While they resent the military and Sinhalese politicians, there is also bitterness towards the Tamil Tigers, who some also blame for their disaster. One student, now 18, who I met in Mullaitivu district saw the rebels shoot her father dead in front of her while he was trying to take the family to safety in the final stages of the war. Her mother then bled to death by the lagoon after a landmine blew her legs off. Defeated, humiliated and stigmatised, Tamils now seem to have fewer options. Some look to the main Sinhalese parties for their demands, as they did in the past. Others are concerned that a small section of the Tamil diaspora and remnants of the Tamil Tigers abroad are trying to foment trouble by meddling in local politics. "After the bloody war, the Tamils were left only with their loincloth. The current activities of the diaspora will ensure even that loincloth will be lost," said one former Tamil rebel official.